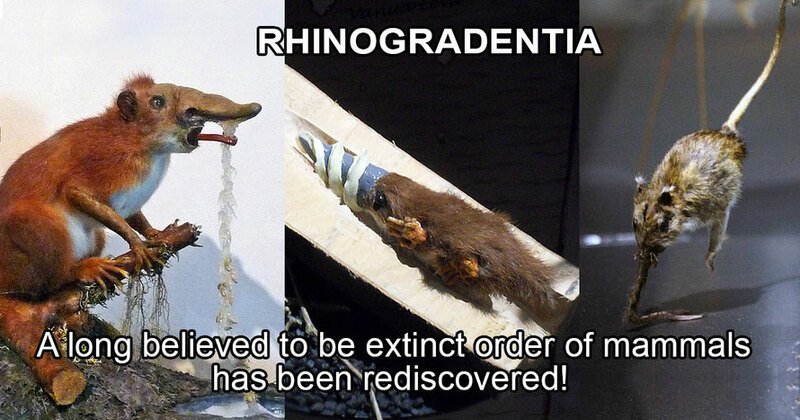 Rhinogradentia, an order of mammal, has been rediscovered on a small Pacific archipelago. The animals are characterized by a nasorium that is a nose-like feature with varying functions in different species. The nasorium is used for movement by species such as Hopsorrhinus aureus and Otopteryx volitans, or catching prey such as Tyrannonasus imperator that is also the largest land-based predator of this order. These animals have been first described by Prof. Harald Stümpke in his book “Bau und Leben der Rhinogradentia” (“The Snouters: Form and Life of the Rhinogrades”).